No AV is perfect. I own several (McAfee, Malwarebytes, Zelmana, Threatfire,...). I own WebRoot for ALL ITS FEATURES, particularly the WPM. It is my ONLY password manager since I trust WebRoot. This has gone on way too long. Get Firefox (and Safari) fixed. And more importantly, fix your process for testing releases from these vendors. Join their development communities and test release candidates BEFORE they are publicly released. Yes, I am yelling. I am seriously aggravated that this has gone on this long, and that WR keeps failing to correct this recurrent defect in their process. Q: How many times has a browser update broken their product plug-in? As most of you are aware, we have a long standing partnership with LastPass and there have been some issues lately with version upgrades that is piling up issues. We have made attempts to fix individual problems while we work towards a more permanent fix. I am happy to share that we are moving towards a more robust solution where there will be no delays in getting the updates and our customers will always be on the latest and greatest versions while ensuring that the software is also compatible with upcoming platform and browser updates. As for a timeline, we are very close to completing the new integration and i will have updates for you later this month. Thanks for being a webroot customer. I completely understand the frustration and i am eager to share better news as soon as possible. With respect, I will keep Webroot with or without WPM rather than the likes of McAfee. This has been going on for weeks now and the members have been told virtually nothing other than go to support, but they deserve to be told something at least even if it is not going to be a solution. So come on will someone from Webroot do something about it, the members need help? @Yarco they are both working fine here! Maybe Submit a Support Ticket and ask them to look into it! Thanks Daniel, beginning to think I had something peculiar to my system. Mops brow and pours stiff scotch. 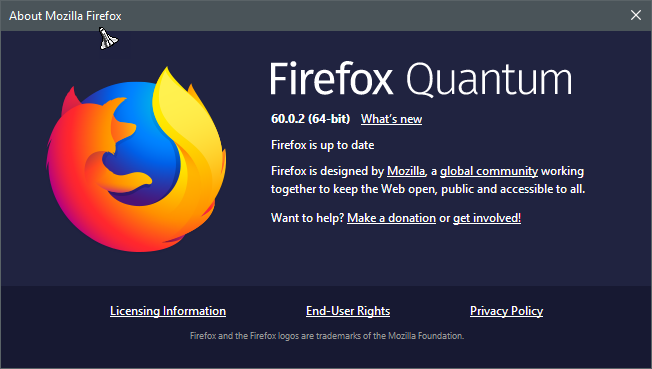 Go to the folowing site https://ftp.mozilla.org/pub/firefox/releases/ and download ver. 60 backup your data and uninstall ver 62 now install ver 60 and password manager everything should work as designed.